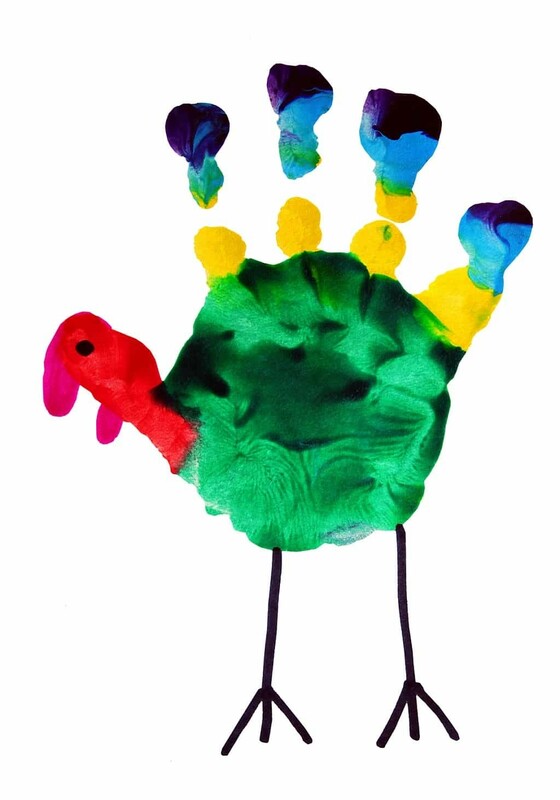 Over 100 simple Thanksgiving arts and crafts ideas for preschoolers through second grade. Turkey Sweatshirts: Each child brings in a sweatshirt. Their hand-print is placed in the center of the shirt . Paint palm and thumb brown, remaining fingers with assorted bright colors for feathers. Orange feet and red “gobbler” can be added by the child with fine brushes. Potato turkeys will make kids proud and parents smile. Very simple, but a little work on your part… each child gets a potato. cut out small colorful feathers from construction paper and have children glue two (facing each other) onto toothpicks. once dry, stick the other end of the toothpicks into the back of the potato. You can make a head with waddle the same way and have them put googly eyes on before they stick them in. These are really great and give kids a chance to feel artistic and successful. Have each child bring a potato to school. Cut feather shapes out and glue them to toothpicks. Allow the children to stick the feathers into the potato to make a turkey. Add wiggly eyes and other shapes from foam. My kids loved this activity. This a great family project or preschoolers it loves too!! Draw two corn cob shapes onto white construction paper. Have children cut out the shapes. Pop 2 cups of popcorn. (Children love to eat the popcorn, so make a little extra) Staple top of cobs together spread bottom apart. Put red, yellow, and brown dry tempera paint into 3 different zip lock bags. Put a small amount of popcorn into each bag, and shake until the desired color. Put dots of glue all over the corn cobs and place popcorn onto the glue. Staple real corn husks to the top of corn cobs. These make beautiful table or window decorations!! For Thanksgiving, create your own tablecloth. Purchase plain white paper tablecloths and let the children sponge paint leaves, pumpkins, and fruit prints. You can use pre-cut sponges and/or everyday materials like apples, leaves, pears, feathers…etc. Children will have lots of fun and parents will love to see what their kids made. This is similar to the potato turkey, but we use the tiny gourd pumpkins. Have the children punch holes on one side of the pumpkin ( about 6 or 7)with a small nail. Push feathers in the holes. next, out of construction paper make a head shape, beak and waddle. Glue together and tape or staple to the front of pumpkin (glue doesn’t work well). Attach wiggle eyes and poke one hole on each side and poke in feathers for wings. CUTE! We use them to decorate our table settings. Using Model Magic make a ball the size of an orange. Add color to it by drawing on it with marker and mashing it in. This gives it a marbleized effect. Stick a small wooden spoon (found in craft stores) in one end of the ball and 5 colored feathers into the other end. Add detail to the spoon to make a face. This makes a cute table decoration. Using brown construction paper have children cut out Turkey shapes or provide them for the children. Cut a hole (the size of a doorknob) in the turkey’s tummy. Provide feathers or feather cutouts to be glued onto the backside of the turkey. Provide facial features for the children to glue on. A cute saying printed on a small piece of paper glued to a toothpick (to make a sign) “I’ve lost my stuffing” (Glue or tape to the side of turkey) For extra stability use Bristol board instead of construction paper. i did this project with my toddlers and they loved it. Precut a yellow construction paper corn cob shape. have the children use bingo markers and create as many colored dots as they wish on the corn cob shape. I used blue, green, orange, red, and purple markers. When they finished i stapled on real corn husks. They looked so cute!